Fill up a pretty basket with these cute and fluffy biscuits, great for breakfast, lunch or dinner! Cut shortening into the self rising flour. Add buttermilk to the mixture. Pour the flour over a clean, flat surface. Transfer dough to floured surface. Knead repeatedly until flour has coated the dough. Roll out the dough to about ½ thick. 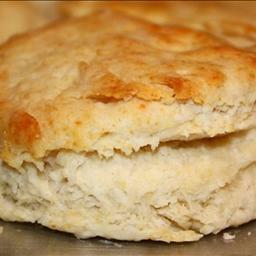 Use a biscuit cutter or cut about 10-12 round biscuits. Paint with butter and place on a greased baking sheet.